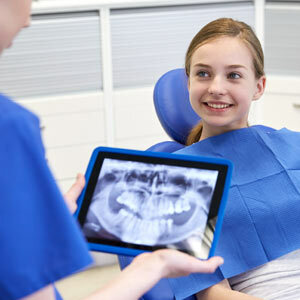 Your child’s dental care wouldn’t be the same without x-ray imaging. It’s one of our best tools for finding and treating tooth decay. But since x-rays emit radiation, is your child in any danger when they’re exposed? X-rays, an invisible form of electromagnetic energy, will form images on exposed film after passing through the body. Because it takes longer for x-rays to pass through dense tissue like teeth and bones, the corresponding areas appear lighter on the film than less dense tissue like the gums. We can detect decay because the diseased tooth structure is less dense and thus appears darker against healthier tooth structure. The downside of x-rays, though, is the radiation they emit could potentially alter cell structure and increase the risk of future cancer, especially with children. That’s why we follow a principle known as ALARA when using x-ray imaging. ALARA is an acronym for “as low as reasonably achievable,” meaning the doses for an x-ray session will be as low as possible while still gaining the most benefit. Advances in technology, particularly the development of digital processing, has helped reduce the amount of radiation exposure. We’re also careful with what types of x-rays we use. The most common type is the bitewing, a device with the film attached to a long piece of plastic that the child holds in their mouth while biting down. Depending on the number of our patient’s teeth, we can usually get a comprehensive view with two to four bitewings. A typical bitewing session exposes them to less radiation than what they’re receiving from natural environmental background sources each day. Keeping the exposure as low and as less frequent as possible greatly reduces health risks while still getting the full benefit of early decay detection. Still, if you have concerns about your child’s x-ray exposure, we’ll be happy to discuss our approach and all the precautions we take using x-ray imaging.